I saw saxophonist Larry Ochs when he came to town in October as part of the Northrop Music Season and played the Whole Music Club. He's not for everybody, but that's true for most improvised music. He's a fascinating, prolific, highly creative artist who's internationally known and respected. I enjoyed seeing him play, and I enjoyed speaking with him ahead of time. I like his latest CD, Stone Shift, very much. Read an interview with Ochs and outtakes if you're interested. As reported in the Guardian (and other places since), Ochs was performing with his Sax & Drumming Core at Spain's Siguenza Jazz Festival on Monday night (Dec. 7) when a man in the audience called the police, complaining that Ochs' music was not jazz but "contemporary music." He said his doctor had warned him that it was "psychologically inadvisable" for him to listen to contemporary music. The police showed up. The man demanded his money back. He didn't get it. The case will eventually go before a judge. Earlier today (Monday Dec. 21) things got even sillier. 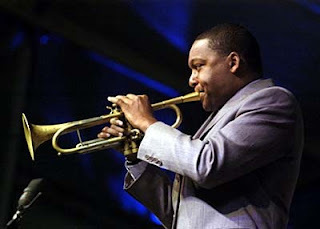 Wynton Marsalis asked the Guardian to find the man (now dubbed "the jazz purist," like that's a good thing) so he could thank him and send him a package of his music. The man, Rafael Gisbert, has since stepped forward. Wynton's people are claiming this was never supposed to go public. Is it possible to appreciate both the music of Wynton Marsalis and the music of Larry Ochs? Duh, yes. Must one choose sides? Why? Should definitions of what jazz is/isn't further divide an already small audience for the music, which is attractive in large part because of its variety and rebel nature? 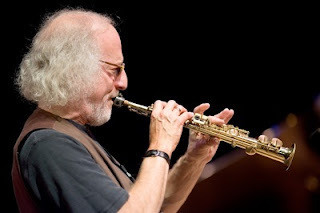 Blogger Philip Booth writes: "Kenny G wields his chirpy soprano sax for bland instrumental pop, markets it as jazz, makes a mint, and nobody bats an eye.... Where are the Jazz Police when you really need them? They'd really come in handy when a certain local festival turns over all its headlining positions to boring 'smooth jazz' acts. I'd welcome the Jazz Police to help keep incessant talkers and noisemakers from rudely ruining my enjoyment of concerts. And maybe pianist Keith Jarrett would cease his godawful audible humming--which sometimes spoils otherwise brilliant solo and trio performances--if there were a chance that the Jazz Police would intervene." I read this and laughed out loud. Which might be the answer to the whole brouhaha. The photos at the top of this blog are there for fun. According to reports, Ochs has behaved like a gentleman, saying "I thought I had seen it all. I was obviously mistaken" and "Stay tuned."